Author Chat with Tara Lynn Masih (My Real Name Is Hanna), Plus Giveaway! 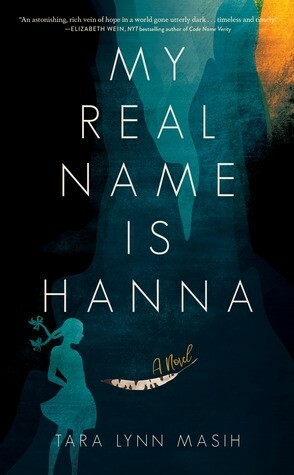 Today we're excited to chat with Tara Lynn Masih, author of My Real Name Is Hanna. Read on for more about Tara and her book plus a giveaway! 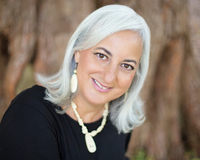 Tara Lynn Masih is editor of two ForeWord Books of the Year, The Rose Metal Press Field Guide to Writing Flash Fiction and The Chalk Circle: Intercultural Prizewinning Essays. She is author of the critically acclaimed short story collection, Where the Dog Star Never Glows, and Founding Series Editor for The Best Small Fictions annual anthology. My Real Name Is Hanna, her first novel, received a 2018 Skipping Stones Honor Award. Meet My Real Name Is Hanna! Hanna Slivka is on the cusp of fourteen when Hitler's army crosses the border into Soviet-occupied Ukraine. Soon, the Gestapo closes in, determined to make the shtetele she lives in "free of Jews." Until the German occupation, Hanna spent her time exploring Kwasova with her younger siblings, admiring the drawings of the handsome Leon Stadnick, and helping her neighbor dye decorative pysanky eggs. But now she, Leon, and their families are forced to flee and hide in the forest outside their shtetele--and then in the dark caves beneath the rolling meadows, rumored to harbor evil spirits. Underground, they battle sickness and starvation, while the hunt continues above. When Hanna's father disappears, suddenly it's up to Hanna to find him--and to find a way to keep the rest of her family, and friends, alive. A documentary titled No Place on Earth, about the Stermers and their family and friends, who hid underground in caves to avoid being killed by Nazis during World War II. It was riveting. Even my young son was greatly affected by the story. I couldn't stop thinking about it, and the next day, sat down and began a very rough draft. My family is fictional, but I did a lot of research over the years to find out anything I could about the area of Ukraine that they lived in and how they survived. Their story is incredibly inspirational, and I'm glad others will read about it and hopefully they will watch the film themselves. Besides my main character, Hanna, my favorite character is Alla Petrovich, a Ukrainian neighbor who befriends Hanna. I liked watching their relationship unfold, and I think their message of crossing cultural barriers is needed now more than ever. Alla represented all the good that there is in human beings; she was sort of the light that fought the evil darkness that surrounded them. The novel came first, but it had a different title early on. I was using the working title The Witness Tree, because there's a tree in the novel that plays a big part in the family's survival. That's all I want to say about the tree, but my publisher rightly felt it didn't capture the humanity in the story, so we worked with the first line in the book. It took time for me to adjust, having called it The Witness Tree for many years, but now I love My Real Name Is Hanna. I don't think there is one scene in particular, but the section where they are in the cave is for me the most dramatic and was the most challenging to write. First, because I've never lived in a cave and had to really go deep into my imagination, despite having some biographical material from Esther Stermer, and second, because I wanted the writing to match the way that Hanna is spiraling downward. That I can finish a novel! That I have to be very passionate about the subject in order to do so, or I lose interest. I love the entire cover. But I think what I like most is the feeling that the female figure is sort of trapped at the bottom of a cave, which is very dark, but there is this little bit of shining yellow-orange light, or hope, at the top. Empathy. And reading is an important part of developing that superpower. I hope this book will increase your empathy toward the Other. I hope you will remember Hanna (and the other Holocaust victims) when you go through your own hard times, and that you will always fight for what is right, as Alla does. Standing up for your fellow classmates and neighbors can save lives. Over time, I'll be donating a portion of my royalties to the United States Holocaust Memorial Museum in honor of the three Holocaust survivors who are mentioned in the book's dedication. We can't forget these stories. Behind the stories are real people, real lives lost. It's hard for our brains to take in millions. Sometimes we need to focus on one to understand the loss. Thanks so much! Designed by Sophie Appel. The cover is nice. The storyline sounds great. I have read many a Holocaust story. They always touch my heart. It sounds like a great read, and an Amazing Cover! The cover is beautiful. I'm a huge fan of The Book Thief and others like it, so this synopsis sounds really exciting. Family bonds, Holocaust, historical fiction all wrapped in one and a young girls journey definitely sounds like a book for me. The cover is stunning, very eye catching and grabs your attention. The cover and the story are both about darkness and hope. I like the design of the book cover. This sounds like a powerful story and Hanna sounds like a great character.